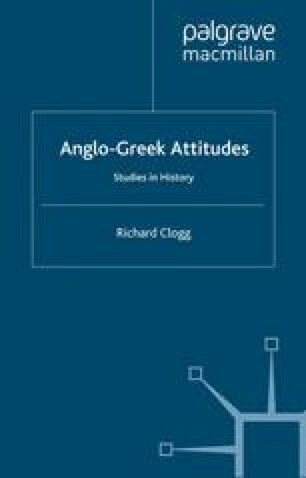 I should make it clear that I do not intend in this chapter to give a systematic analysis of the development of British policy towards the Greek resistance during the period I particularly want to look at –roughly the time from September 1942, when the Harling mission was parachuted into Greece, until the signing of the Plaka agreement (which patched up the civil war within the resistance that had begun during the previous October) at the end of February 1944. Sir Llewellyn Woodward has already performed this task competently in his chapter on British policy towards Greece in his British Foreign Policy in the Second World War,1 and it would be pointless to try to duplicate his efforts. Sir Llewellyn himself made the point that his account is told from the Foreign Office point of view and that he has not made use of Special Operations Executive documents which might put SOE’s case and which remain inaccessible, apparently for the indefinite future (see page 178). This is a little puzzling for there is a considerableamount of SOE material available in the Foreign Office papers, some of it in the form of pièces justificatives written specifically to counter Foreign Office criticism. My intention here is mainly to fill in some of the gaps in previously published accounts and, in particular, to chart, as far as is possible on the basis of the available documents, the disastrous course of the Foreign Office’s relations with SOE, which reached their nadir during the visit of the delegation of six Greek guerrillas to Cairo in August 1943, after which SOE in the Balkans was brought under the direct control of the Commander-in-Chief Middle East.